Inspired by the happy endings every Princess receives in the fairy tales, the new collection is sweetly and prettily packaged. We've got a red lipstick that's homage to Snow White, and a mascara with a picture of a genie lamp in a nod to the exotic Princess Jasmine~ Check it out! Let's start with the Snow White line - I am just loving the white and red themed packaging. It's really clean and modern, but also very visually striking. 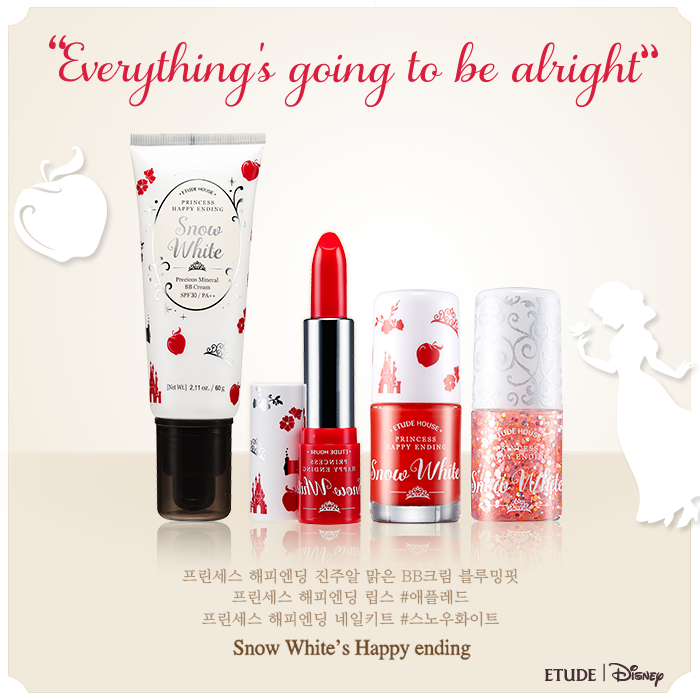 Now we all know that the main points of Snow White's beauty is red lips and fair skin, right? 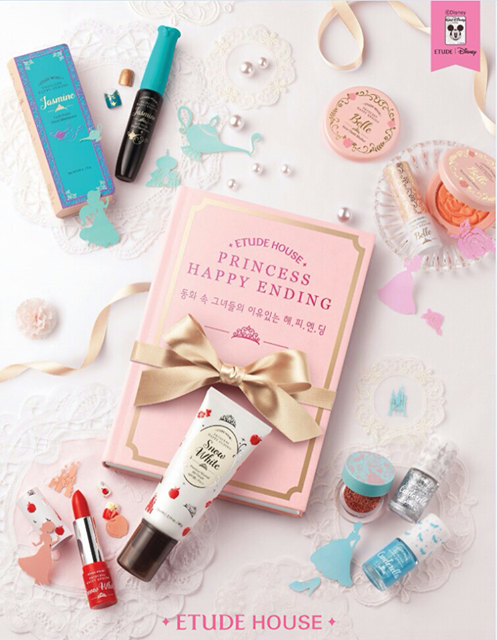 So Etude House has repackaged their best selling Precious Minerals BB Cream to reflect this fairy tale. The apples are just too cute. We also have this super cute nail polish and nail sticker set. I really like this one out of the lot! Apple stickers - too adorable! The next princess to have inspired a collection is the very sweet Cinderella. Ahh, I loved the movie a lot as a child! 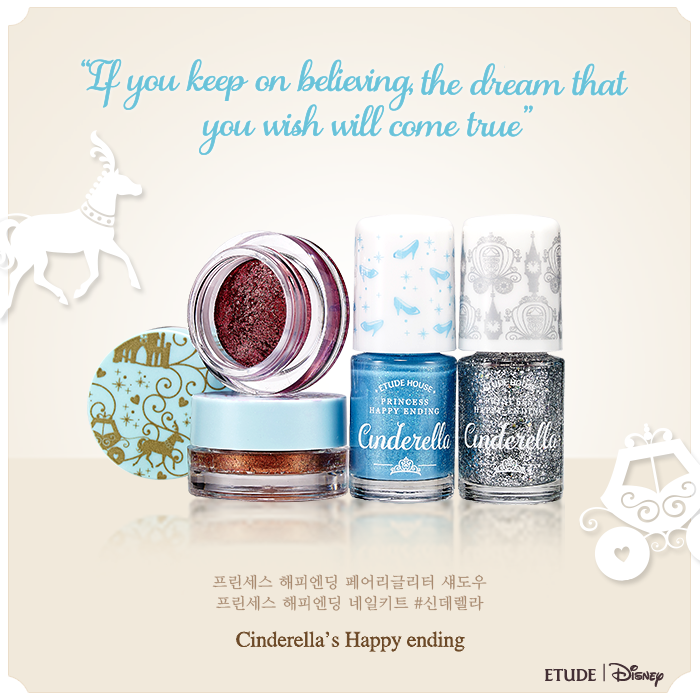 Aww, it's cute how they made the nail polish set blue and silver to match the ball dress Cinderella wore in the Disney movie! Hehe, I also love the horse and carriage, and the glass slipper details on the packaging. The shimmery eyeshadows came as a bit of a surprise - I don't really see how they tie in with the Cinderella story - especially that rusty-red shade. But hey, it does look super pretty in the promo pics! And here's the nail set for the lovely Cinderella. I like it! Such an unusual shade of blue, and the bling stones add a delicate and pretty touch. 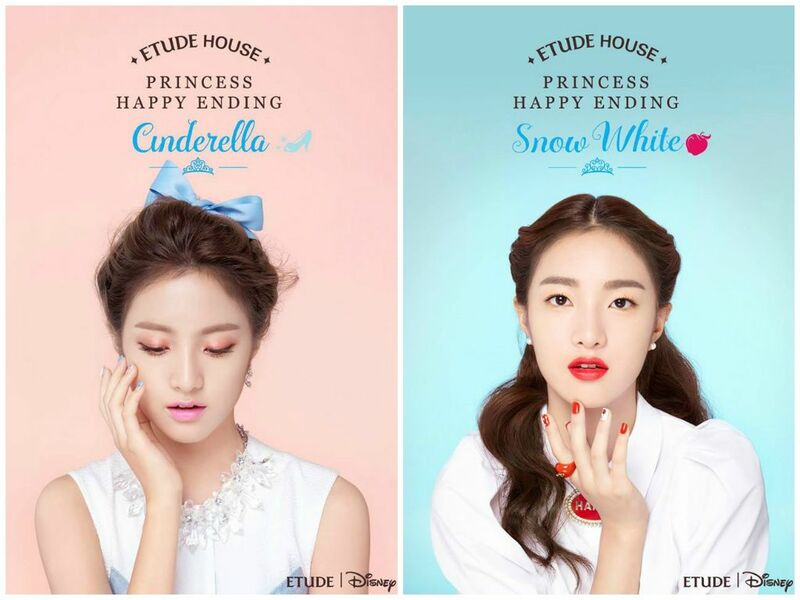 Updated: Etude's just released another makeup tutorial, creating the Cinderella look above - check it out! Rose Cheek Blushers - to represent the enchanted rose from the fairytale. How sweet and pretty are these! Almost too pretty to use. The shades look so soft and delicate. The pink shade seems a bit hard to wear though, for those who don't have very fair skin. Another homage to the enchanted rose - purple toned lips are trending heavily this year, and this lipstick is perfect if you want to try this trend because it's not over the top purple. And last but not least, we have a few Princess Jasmine themed products. A repackaging of their Lash Perm mascara - with a little genie lamp illustrated on the tube. Hmm, it's a bit lacking to me to have a repackaging of an existing product rather than creating something new, but oh well. 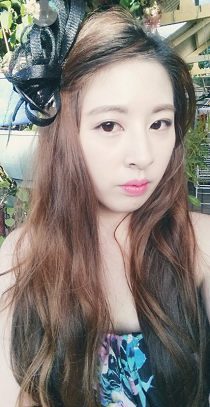 I'm surprised Etude didn't do a black kohl eyeliner, or something like that actually! The nail set is quite distinctively Arabian inspired with that shade of turquoise, offset with gold swirly detailing. This would be beautiful to wear in the Summertime I think. I'll finish off with a few more promo pics of the lippies and nail sets - I cropped them in order to show them separately per Princess theme above. My final thoughts - love the fairy tale princess concept, love the packaging, but I didn't find this collection as thrilling as I should have. I'll tell you why - and I'd love to know if any of you are feeling this way too. You know what would've been cool? If they had a more extensive range for each Princess, rather than having a mish mash of 4 different 'collections' in the one release. I mean, poor Princess Jasmine only got a mascara and a nail set! If they had concentrated on just one Princess at a time they could have released 4 separate collections over the rest of this year! Other than that two items were just a repackaging of current existing products, as far as I can tell - the bb cream and the mascara. They just released the lash perm mascara in the Lock 'n Summer Collection in late June. And you know what, that one also had a blue cap - it was an electric blue, but still! As for the bb cream (which I love to death by the way), as far as I know there's already 3 versions (with teeny tiny variations in the formula) out there...I love the Snow White packaging - I really want it actually, but maybe they could have added something else in addition to the repackaging. And while the rest of the new products look lovely, they also aren't new new, if that makes sense. We always see the same two blush shades - baby pink and coral peach, we always see the same gold and brown eyeshadows (even that reddish pink shade is eerily in the same vein as one of the shades in the Rose And Collection, and in the Play Color Palette released in the last several months). 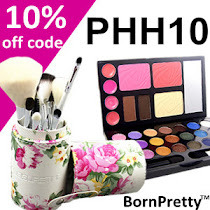 The only thing I found quite 'new' was the purple toned lipstick, which is different to the baby pinks, fuchsias, reds, corals, and oranges that Etude generally prefers. Obviously I can't expect Etude to come out with something innovative and different every collection - especially given they have a release rate of about every two months! Maybe I'm being too picky lol. 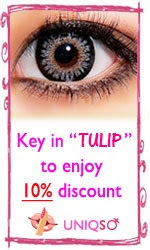 But I guess they are just following the trends and the tastes of the Korean female demographics too. But tell me lovelies, will any of you be indulging in this collection? 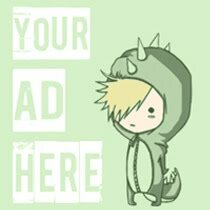 Well, I'd want some of these simply because they're cute! But I do agree with you, they aren't terribly unique, and they could have done so much with this theme! I do like the look of the blush and the purple rose lipstick though! The eyeshadows aren't what I expected either, they look a bit like the gel shadows Essence put out (Stay All Day shadows) or perhaps the Maybelline Color Tattoos? Etude's so good at tempting me with packaging - even though I might already have similar items in similar shades, I still get tempted! That's a good point regarding the repackaging - hehe, I guess because I stalk all their releases I just get bored of seeing the same stuff pop up in new packaging when I'm craving something completely new. I too would've loved to see a few more lippie shades, seeing how much of a lip junkie I am - on the other hand at least I save some money! Nice picks - hope you enjoy them! Hehe, it's terribly hard to resist cute packaging! 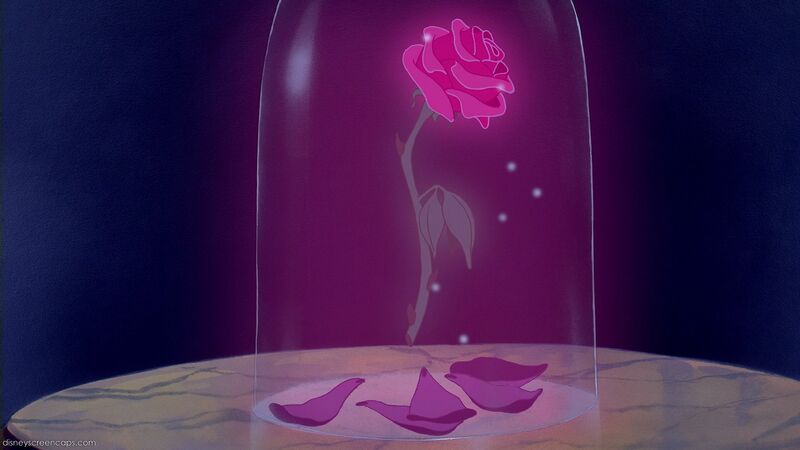 I wish Etude had done more with the concept - it just seemed a tad incomplete to me, seeing as how some princesses got a few range while others didn't. I definitely think the purple rose lippie was one of the more unique items of the lot! Ooh, yeah the shadows do look a bit like the Maybelline color tattoos, it'll be interesting to see any reviews on them in the next few weeks. I actually picked up almost everything from this collection as my etude house makeup collection is sorely lacking. I didn't get the bb cream, the mascara, the blush or the red lipstick. Anyways, I'm excited to start testing everything soon but my heart breaks at tearing the packaging apart.